Trial:	Venued to Vigo County (01-24-80); Found Incompetent (05-19-80); Found Competent (09-02-80); Found Incompetent (01-16-81); Competency Hearing (06-10-82, 06-11-82, 06-14-82, 06-16-82, 06-18-82); Found Competent (06-28-82); Insanity Defense filed (07-02-82); Insanity Defense Withdrawn (08-12-82); Voir dire (08-31-82, 09-01-82, 09-02-82, 09-03-82, 09-07-82, 09-08-82, 09-09-82); Jury Trial (09-09-82, 09-10-82, 09-11-82, 09-13-82, 09-14-82, 09-15-82, 09-16-82, 09-17-82, 09-18-82, 09-20-82, 09-21-82, 09-22-82); Verdict (09-22-82); DP Trial (09-23-82); Verdict (09-23-82); Court Sentencing (10-21-82). Pivarnik Opinion; Givan, Shepard concur;Debruler and Prentice dissent. PCR Petition filed 12-03-86. PCR denied 09-04-87 by Special Judge Robert Brown. Affirmed 3-2; Pivarnik Opinion; Givan, Shepard concur; Debruler, Dickson dissent. Affirmed 5-0; Givan Opinion; Shepard, Dickson, Debruler, Sullivan concur. Petition for Writ of Habeas Corpus filed 09-06-95 in U.S. District Court, Southern District of Indiana. Writ denied 11-14-02 by U.S. District Court Judge Sarah Evans Barker. Wallace v. Davis, ___ F.Supp.2d ___ (S.D. Ind. November 14, 2002). Wallace v. Davis, 362 F.3d 914 (7th Cir. March 26, 2004). Affirmed 3-0; Circuit Judge Frank H. Easterbrook, Judge Joel M. Flaum, Judge Anne Claire Williams. Wallace v. Davis, 373 F.3d 844 (7th Cir. June 28, 2004) (02-4262). Petition for Rehearing and Rehearing En Banc denied by 8-3 majority of active Judges of 7th Circuit. 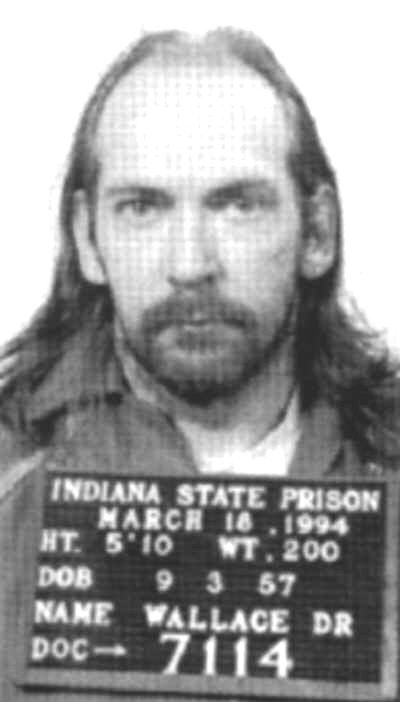 WALLACE WAS EXECUTED BY LETHAL INJECTION 03-10-05 12:23 AM EST. HE WAS THE 82ND CONVICTED MURDERER EXECUTED IN INDIANA SINCE 1900, AND THE 12TH SINCE THE DEATH PENALTY WAS REINSTATED IN 1977.